Monster Studios is a mobile app that gives recruiters the power to record, edit, and publish videos to Monster Job Ads in minutes. Now you can reach candidates in a more intimate and authentic way. Currently in beta, Monster Studios is being offered as a value-add to customers who purchase Monster Job Ads. 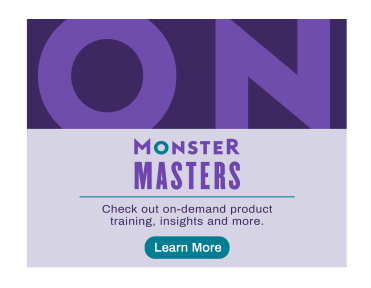 Access the Quick Reference Guide and watch the training videos below to see how easy it is to create your own video job ad with Monster Studios. Follow along and create your first video job ad in minutes – helpful tips included. Keep this resource bookmarked for quick reference while you're creating your video job ads. Not sure what to say? Check out our sample scripts for inspiration and get some advice along the way. See how Monster Studios can work for you. Record a professional video to include with your job ad. This video will walk you through it from start to finish. Customize your video job ad with text overlays, images and more. It's easy! Add your videos to your job postings. And find out how you can share them with your social network, too. Once you’ve mastered the basics, check out some advanced editing features you’re sure to love.